Show her your romantic side! 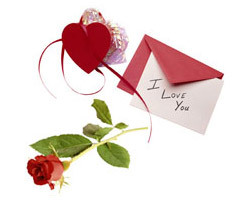 Surprise her today and treat her with one of these fun and romantic gestures. Buy her a massage at a day spa. Rent a romantic mushy movie that you know she will love. Make some popcorn and snuggle on the couch. Go away on a mini-break: a weekend skiing; visit NYC; visit family; a trip to the country or the beach. Write her a love letter and send it with flowers. Make her a bubble bath while you cook a romantic dinner. Create a music mix of your favorite songs. Take her on a picnic. Have her favorite food and desserts. Take her out for a night on the town. There are always fabulous plays or musicals going on. Go out for dinner before or after the show. You can always ride in style with a limo and make her feel like a star. Treat her to a hot air balloon ride with champagne and flowers. Out of the blue, give her a small gift - she'll love almost anything - to let her know you are thinking about her. Without her having to ask you...Hang her new mini-blinds, fix that faucet she's been complaining about, trim her hedges! We're serious! Even these not-so-romantic, handyman type gestures will let her know you care.